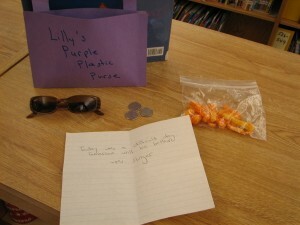 I’ve been reading Kevin Henkes books with pre-k this month, and last week we read Lilly’s Purple Plastic Purse. I made my own version of the purse with all the goodies Lilly’s has: the fancy sunglasses (the kids don’t notice that mine aren’t sparkly with a chain), the 3 shiny quarters (they couldn’t believe they were REAL QUARTERS), the note Mr. Slinger leaves for her, and the cheesy crunchy snacks he puts in there. This was a hit, even though mine doesn’t play music. One of our staff suggested I put one of those greeting cards that play music when you open it inside and just hide it from the kids. Maybe next year I’ll try that.